What are the Best Binding Machines for Elementary Schools? The Accel Flex by Coverbind is a thermal binding machine that uses thermal binding covers to produce exceptionally professional bound documents, without any complicated or time consuming punching and inserting. Instead, all you have to do is put your pages into the thermal binding cover of your choice, and then place the cover into the machine. It automatically turns on and heats the pre-applied glue in the cover to pull your pages in and secure them tight. Once this step is done, all you have to do is move it to the cooling station so the glue can finish bonding. The entire process only takes about 60 seconds, PLUS you can make as many as 15 books at one time...talk about a time saver! That is 15 books in just one minute. How many punch-and-bind books can you make in one minute? Maaaaaybe one, if you are a skilled book binder. 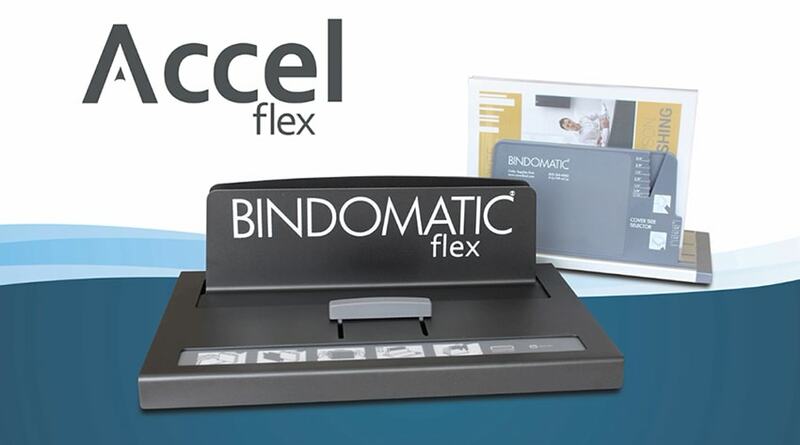 The Accel Flex (sometimes called Bindomatic Flex) retails at just $599, and with a free cooling rack included, this awesome thermal binding machine will pay for itself within just a few uses. It is less expensive than the punch and bind alternative, allows for document binding up to 2" thick, and is so incredibly fast -- why every elementary school doesn't own one of these little powerhouses yet is a mystery to me. So be sure to share with your teachers, office staff, and buyers -- everyone on campus will LOVE this document binding machine. Learn more about the Accel Flex here, or shop the variety of thermal binding covers available here. 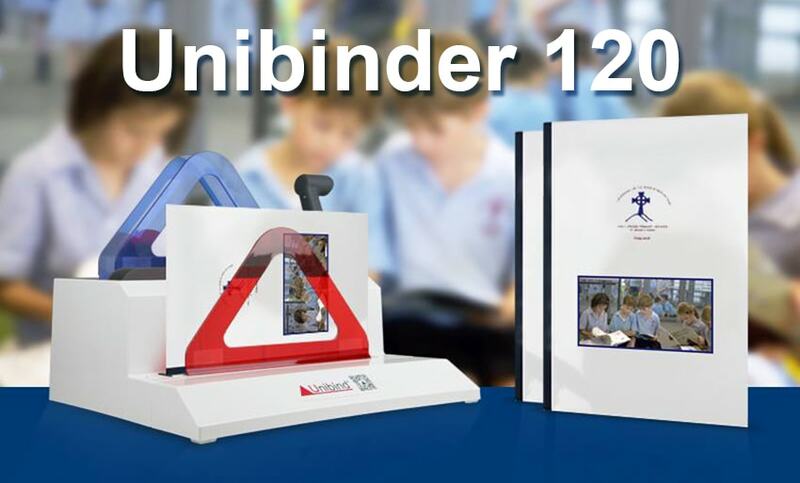 The Unibinder 120 is another thermal binding machine that is perfect for grade schools, in particular. Just like the Accel Flex discussed above, it is fast, easy, and requires no punching or binding. The main difference here is the kind of covers used to bind your pages together. Instead, this Unibind thermal binder uses steel spine binders, which are what activate the machine upon contact. This means you cannot use it with any other binding covers other than the proprietary Unibind thermal binding covers. That being said, this little office binding machine is fantastic. Just place your pages into the thermal binding cover of choice, place the cover onto the heat plate, place it into the crimp station and pull the handle, and then move the cover to the cooling rack to finish bonding. The binding process with the additional crimping step takes just a bit longer, at about 2 minutes, and you can bind up to 1/2" at a time, meaning you can make multiple books at the same time when using thinner spines. The UniBinder 120 retails at $595. The color of the heat and cool station supports offers easy recognition, and can serve as a nice warning for young students if this becomes an in-classroom binding machine. Whether used in the classroom, the office, or the print room of your school, everyone who uses this thermal binding machine will rave about how fast and simple it is. Learn more about the Unibinder 120 here, or shop the various Unibind steel thermal binding covers here. 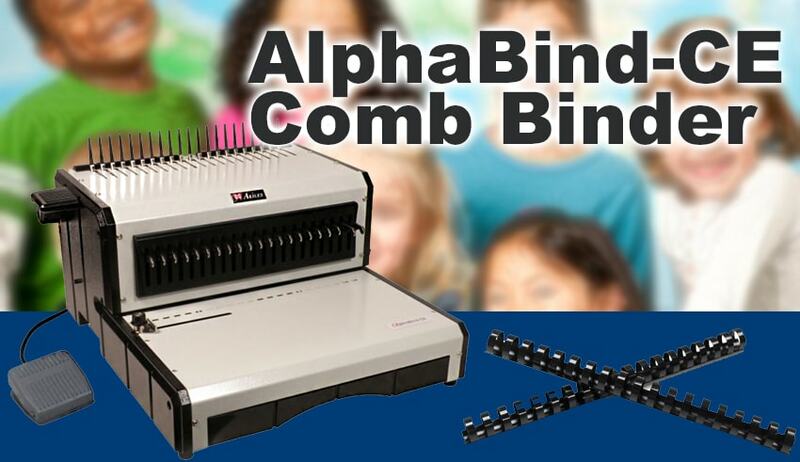 The AlphaBind is a traditional plastic binder machine that works with binding comb spines. It is perfect for those who want the traditional punch-and-bind with the incredibly affordable and versatile plastic binders (after all, binding combs can even be custom printed on). This machines is a perfect mid-level choice for elementary and grade schools. It has electric punching via foot pedal to make more frequent binding easier, and a manual comb opener, which is pretty standard for all plastic GBC comb binding machines. It also has pins that you can pull out (on the front of the machine in that black section) which lets you customize the punching pattern; this is very helpful if you bind books of varying sheet sizes. The Akiles AlphaBind has a bit more of an expensive retail price than the two options discussed previously, priced at $692. But we are offering a sale price when you call us at (866)537-2244 (866)537-2244 that makes it much more school budget-friendly. Learn more about the AlphaBInd-CE here, or shop plastic GBC binding combs here. 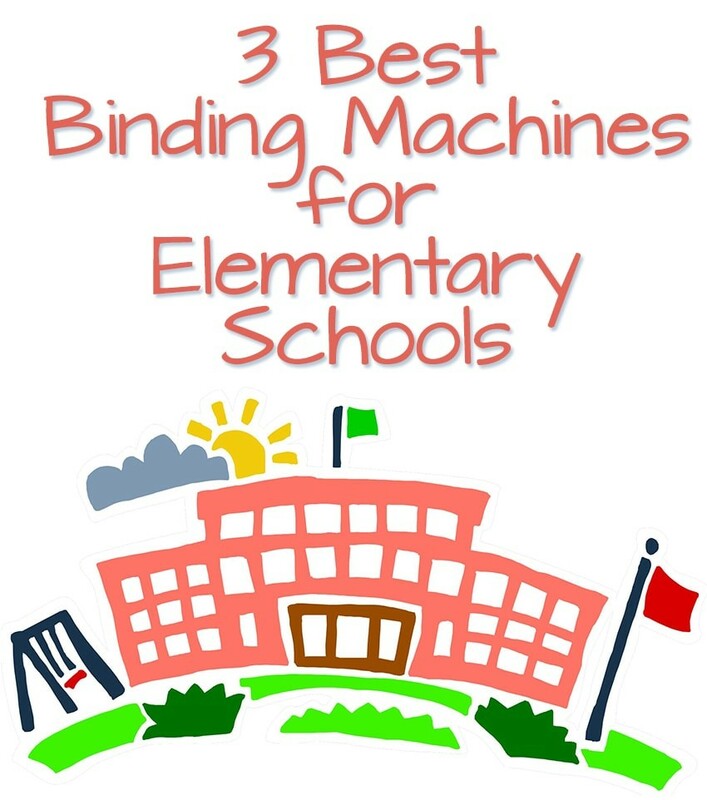 So with those three points (easy, fast, affordable) in mind, we've put together a list of the 3 best binding machines for elementary schools. What do you think of our choices? They are simple to operate, allow to you quickly bind documents, and are priced around $600, so can fit within even some tighter school budgets making them perfect for elementary and grade schools.